Everyone knows the story of Ebenezer Scrooge, Bah Humbug. Who on Christmas Eve is visited by three ghosts who will make him question his life and attitude towards those around him. Will he be able to understand Christmas before it is too late? Michael Caine takes on the role of Scrooge and is pretty much surrounded by the Muppet. So we have the Muppet telling the story as Gonz takes on the role of Charles Dickens and narrates the story with a rat which makes it rather amusing and plenty of laughs for the children watching. Kermit is Bob Cratchit with Miss Piggy as his wife. All of your favourite muppet will feature in the film at some point and this is something you will enjoy from start to finish. This has always been one of my favourite Christmas films if not my all time favourite! 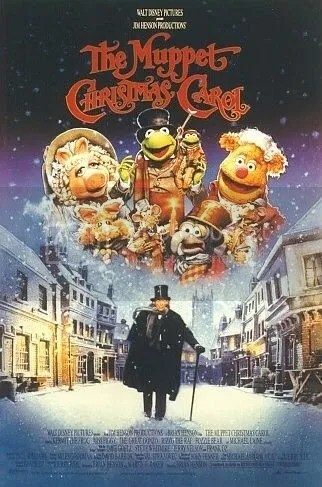 I have always loved everything about it and think the muppet fashion of having songs to help lighten the mood and give it something a bit different to other versions of A Christmas Carol. It still gets the brilliant message across about how you should be in life and not be like Scrooge. My local cinema had this film on so we went to see it at 10am this morning and it was a very good start to Christmas Eve. Actually had quite a lot of people in watching it as well which was even better, especially being able to see the excitement of the children and the first time I have seen it on the big screen myself. The big thing everyone waits for in which ever version of A Christmas Carol they are watching is when Scrooge decides to listen to the ghosts, be nicer to people and embrace life. That is no different for the Muppet version especially with it being Michael Caine. Especially when they get him to do some talk-singing at the end, honestly nothing is better than that! So if you want to see the classic tale with a little bit of a twist then this is certainly the version for you, got to love anything with the muppets in as well. It really is a special film with the very happy singing tone at the end, but not forgetting a few songs you will want to sing-a-long to after you’ve seen it a few times. So if you only watch one version of A Christmas Carol, make sure it is this one! Nice little review. Would love to see The Muppet Christmas Carol in the theater one day. It’s my favorite version of the story. Thanks for your comments, I was so excited to see it at the cinema it really made it even more special! Nice review Caz. One of my all-time favorites, and one that’s always running in my house during Christmas.